Found 2 file extension associations related to BrainsBreaker and 2 file formats developed specifically for use with BrainsBreaker. Never has been so easy and fun having unlimited jigsaw puzzles. 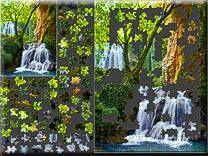 With BrainsBreaker, a game for PCs running Windows, now it is possible to take any photograph and turn it into a jigsaw puzzle, ready to put together at any time. The program has been carefully designed to give you the same functionality and -most important- the same sensations and pleasures you feel when doing a cardboard jigsaw puzzle. As in the real world, the pieces are scattered around the table (the whole screen) and you have to sort them and figure out their position and find interlocking pieces either by its color or its shape. Handling of pieces is done with single mouse operations, you pick a piece pointing over it and clicking, then you just drag it wherever you want and drop it releasing the mouse. If you need more information please contact the developers of BrainsBreaker (Juan Trujillo), or check out their product website.